Happy New Year! It is day 3 of the new year and I feel like the year is flying by already! My family had some very exciting news right before Christmas. Our son is engaged and we couldn’t be more delighted! The nuptials are to be held this fall so we have lots of time to plan. And save! Here is the money savings challenge jar revisited! My son and his fiancé are to be married this November! Already plans are moving ahead at lightning speed. I need to buy a new calendar in order to keep track of everything! We will have showers, engagement parties, etc. Plus, several of our friend’s children are getting married this year too! As we all know, planning a wedding can be very expensive and there are always unexpected last minute expenses that can pop up. Why not be prepared? So, for my son and his fiancé, I’ve made a new money savings challenge jar for each of them so they can save an additional $10,000 by the end of the year. If they have money left over, then hello? honeymoon spending money or a down payment on a home! I bought these over sized pickle jars (on Amazon) last year for a Pottery Barn knock-off lantern project. They worked great but now I envision them as the perfect grown up piggy bank! You can use any type of large jar but I had these on hand. I found a great money savings challenge for $5,000 on Pinterest and printed out several copies. The chart I printed said something about saving for a home and had a red trim. I cut off the trim and the lettering and glued the black and white chart to the front of each jar using a glue stick that dries clear. These cute little Mr. & Mrs. tags are from my favorite store, The Crystal Cottage Boutique in Doylestown, PA. I tied them onto the jars with “happily ever after” ribbon. They turned out great I think! 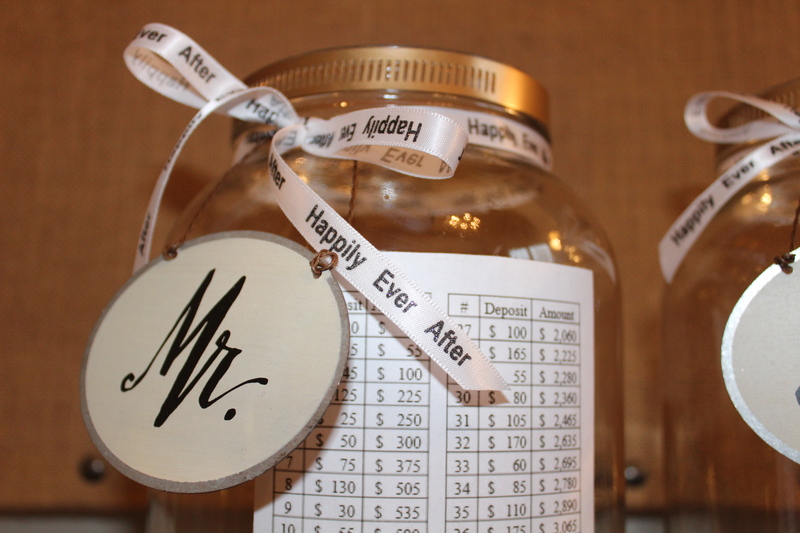 My son and his fiancé will each have a money savings challenge jar to use throughout the year. The fun little Mr. & Mrs. tags will be a fun little way to keep their eye on the big day. As each week passes they can simply cross off the weekly goal. They can even challenge each other and then use the jars in the future to save for something else! I made a money savings jar for me as well. I am notorious for spending any cash I have in my wallet so if I put it in the jar, then I’ll be less likely to spend it! Change from pockets as I do laundry will also find its way to the jar. By year’s end we should all have a nice little stash of cash! The way that time flies these days, it will be here before we know it! By the way, is there a wedding count down app? If you have younger children this is a great way to teach them to save and learn the value of money. There are several money savings challenges for lesser amounts of money depending on their ages and goals. Plus, younger children would love to help decorate and personalize their own jars!